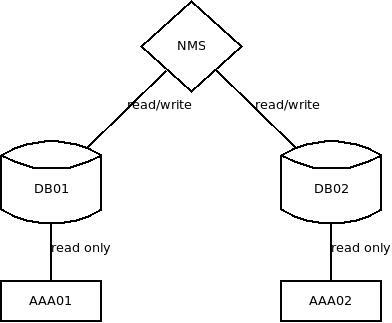 Each NAS-client knows of two radius servers (aaa01 and aaa02). If one goes down, they switch over to the other one. Each AAA server has its own database and aaarails as interface. All connections go via VLANs, so accounting and graphing is done by looking at data from access router interfaces. A NMS system is responsible for creating/updating/deleting customer profiles (via aaarails) and simply sends all write requests to both AAA servers. This setup did run stable for a few years. As long as a NAS-client can get access-accept attributes back from any AAA server, the customer will have connectivity. If one AAA server dies, we just setup a new system and let the NMS system repopulate the database while the NAS-client use the remaining AAA. A new technology required some changes so that we also record accounting packets from the AAA servers. In the old setup all AAA servers used their database read only. 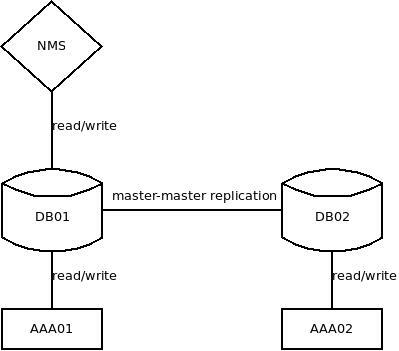 In the new setup all AAA servers need write access to a database and read access is dependent on those writes. With those new requirements in mind I've build a new system that is still pretty simple but also allows one AAA system to die without affecting customers. Below you will find my notes about setting up Bucardo on a Debian 7.8 system for testing. I used the bucardo version that was available in default Debian. This version only supports two masters and has some other limitations. Good enough for my use case, but perhaps you should consider to test the newest version. On both severs: Create a 'deploy' user + password and prepare postgres for remote connections. root@both_servers:/tmp# sudo -u postgres psql -d postgres -c "alter user deploy with password 'testing';"
On both severs: Create the test database. Create the full database on pg01 and the schema on pg02. root@pg01:/tmp# sudo -u postgres psql -d postgres -c "alter user bucardo with password 'bucardo';"
But what if the replication breaks (network down) and a NAS-client starts to switch between two radius servers back and forward? Bucardo follows the strategy that if two values are referenced by the same id, the newest one wins. So data-loss is actually a valid concern and requires some modification to how sequence numbers are generated for the affected tables. The NMS only writes into one master, so this part is not a concern. Freeradius only writes into the accounting table (radaccts). It is required to remove the sequence for this table from bucardo and then modify the way the sequences are generated, to have a non overlapping pattern. The sequence in question is called 'radaccts_id_seq'. In bucardo version 4 removing a sequence is not implemented correctly, but you can use the remove table command which does the job. At this point, the content of the table radaccts is still synced, but the sequences on the two machines now do run independent. Hope that does make some sense to you.